These diary entries document Bukowski's life between 28 August 1991 and 27 February 1993. 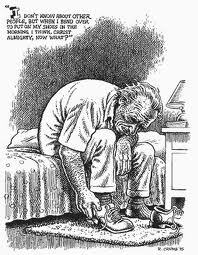 They make amply clear Bukowski's take as a 71-72 year-old on such aspects as horse racing, writing, writer's block, his domestic life, fellow writers, fans, how people are assholes and his impending death. His tone is subdued and reflective as he is deeply aware he will soon die and perhaps at any minute. Robert Crumb provides wonderful illustrations to highlight some key quotes in the diary. 1. Hank's craving for a lobster dinner is thwarted by animal rights activists. 2. Secretary ruins Hank's chances with a poetry groupie. 3. To honor Hemingway, Hank bangs a broad named Millie whose husband, a jockey, wants to pay Hank to keep banging her. There must be a catch. 4. Hank allows a young male artist to paint his portrait and is painted into a corner into revealing his own homosexual experience. 5. A friend of Hank's wants him to invest in his latest scheme. An industrial use for recycled vomit. 6. Hank falls asleep on the lounge and as he wakes, to his horror and surprise, a middle-aged university professor with a big one rams him up the keister in a mad wild gallop. 7. To commemorate Buk's 10th millionth printed word a literary symposium is held in Los Angeles in his honour and is attended by all of his heroes including- Celine, Dostoyevsky, Fante, Hemingway and Mahler, to name a few. They all get sloshed and in a late night celebration accidentally set fire to his remaining manuscripts intended for posthumous publication. 8. Hank takes an unusual break from the track and attends a baseball game. When the cleanup batter is injured Hank is called up to bat. On a 3-2 pitch he hits a game winning home-run much to the jubilation of the crowd- but when he heads for home, he suddenly lurches forward and vomits six half-eaten jumbo hotdogs onto the plate. 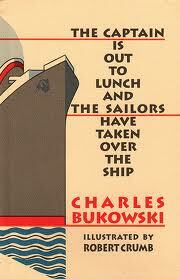 I can see it now: Bukowski on HBO. Rather than buy this book it is probably best to save your hard-earned bucks- unless you have an academic or self flaggelatory interest in Bukowski's writing. You are far better to stick to his fictional writing from this period, especially his poetry: The Last Night of the Earth Poems (1992) is brilliant. His posthumous collections COME ON IN! (2006) and The Flash of Lightning Behind the Mountain (2004) aren't too far behind. Forget Bone Palace Ballet: New Poems (1997) it is embarrassingly thin and highly self indulgent- even by Bukowski standards.